It is hard to believe that another year has raced by. There is so much to say, so please pardon all that I inadvertently leave out and join me in celebrating just a few of the miracles that MickaCoo has accomplished in 2010, including the placement of 66 pigeons and 23 doves into forever homes! Donors from all over the country and as far away as Canada and Brussels contributed over $1400 in order to give a splay-legged ringneck dove named Pierre a chance to stand up, perch, walk and court his mate with dignity. The Flusche Family of Newark built a big, gorgeous pigeon coop (called the Flusche Cooop) specifically to provide much needed foster space for king pigeons and, since its grand opening in June, have provided a wonderful home and care to 19 homeless pigeons that otherwise would have been turned away. Lucy Tolmach, Filoli's Director of Horticulture, built special predator-proof coops so she could adopt eight pigeons to live safely in the 35' x 20' Filoli berry cage. She arranged for MickaCoo volunteers Cathy Kendall, Sherri and Bill Ness, Shafqat Khan, Ingrid Taylar and Cheryl Dickinson to serve as docents to represent the needs of homeless pigeons and doves to the thousands of guests hosted during their 2010 Flower Show. 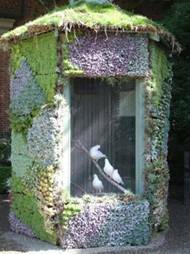 She also opened a Filoli aviary to foster doves when MickaCoo lost an important dove foster parent and will be including MickaCoo at the San Francisco Flower & Garden Show in March 2011 (volunteer docents will be needed). Mickaboo's founder Tammy Azzaro and her daughter Maya, while shopping at Target, spotted a fledgling feral pigeon with terribly string-tangled and mangled feet. Despite hours of trying, they weren't able to catch her, but Mickaboo's Virginia Nevin found AND caught her the next morning and named her Patience. MickaCoo removed the string from her tortured little feet, nursed her back to health and got Patience rehabilitated and released by a MickaCoo volunteer who continues to rehab and release pigeons who can be returned to the wild including (but not limited to) Starbuck, Pi and a baby pigeon rescued during the December 17 storm. Mickaboo volunteers Robert Allen, Katie and Eric Wunderlich and MickaCoo volunteer Cheryl blew me away with their incredible generosity and skills by coming to my home and working for more than eight hours to deep-clean and refurbish my backyard pigeon coop. 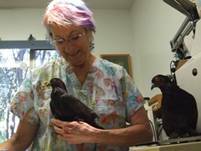 MickaCoo's Super Volunteer Cheryl Dickinson upgraded from a donated flight cage fostering four kings to a huge, deluxe backyard aviary built specially to house her three adopted and 10-15 foster pigeons. Cheryl represented MickaCoo at almost every adoption event held this year, provided intensive care to sick and injured indoor fosters, drove over 2500 miles on MickaCoo business, managed MickaCoo's Craigslist postings, helped with fundraising and garage sales, submitted the winning pigeon photo in the 2011 Mickaboo Calendar and lots, lots more. I call Cheryl “MickaCoo's Vice President”! MickaCoo adopters Clare and Bob joined the MickaCoo foster parent team and tackled disassembling, transporting and reassembling a donated aviary to create MickaCoo's Old Lady Pigeon Retirement Home. This aviary will provide an amazing hospice home for three old female king pigeons, Dee Dee Detroit, Louie and Abby, who needed their own peaceful, relaxing home in which to enjoy their golden years. 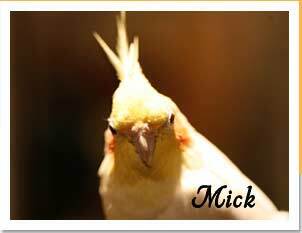 Mickaboo's Louisa Jaskulski rescued two pitiful little Indian Fantail pigeons who were huddling, sick and hungry, next to the gas station where their cruel and heartless person had dumped them when they became sick with pigeon pox. Naming them Tina & Tony, she mothered, medicated, and nurtured them back to health, introducing them to the joys of pigeon pants along the way and lovingly caring for them until they went to their forever home. SFACC volunteer and MickaCoo supporter Kate Edwards organized MickaCoo's first open house and fundraiser, which generated $2000 in donations and was a wonderful, fun and delicious team-building event. 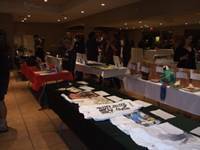 This event was soon followed by an epic Silent Auction organized by Mickaboo's Margie Gear for the Annual Holiday Party, raising another $2000 for MickaCoo. And lots, lots, LOTS more! And yet - there is much still to be done in 2011! Seventy-nine pigeons and doves are currently in foster care and need adoption. Thank you for all that you do! Please contact Elizabeth at AdoptKings@gmail.com if you would like to help, if you have questions, or would like to contribute to MickaCoo Pigeon & Dove Rescue!